Hmmm sounds lovely. We made a big pot of squash soup last night to combat all of the holiday food (no more HAM!!!). I wish I had a bowl of this to help with this cold I’m fighting. Beth, this is on our menu for tomorrow. Instead of chicken, I’m using shrimp. Should be just what I need to start detoxing from all the holiday carbs. Maybe by Valentine’s Day I’ll be ready to pull the rest of the Christmas lasagna out of the freezer. With the snow on the ground outside, this sounds like the recipe for me. Yum! Amy, if I could I would send over a big bowl of this soup for you. Because yes, it is perfect for a snowy day. I’m really looking forward to having some for dinner tomorrow. Glad to know I’m not the only one getting recipes from kid’s cooking sites. Some days I only have the attention span and patience of a child. So it’s kind of fitting that I’d be drawn to them. Anna, I can’t imagine what it’s like to go from the food marathon of the holidays into swimsuit season. Thankfully, we’ve got a bit of a buffer on this side of the world before that happens. Hopefully this soup will help to get our minds off of cookies and cakes and sweets. Mmm, I’ve been very much under the weather these past few days, and this soup looks like perfectly warm and spicy comfort food to me! Tracy, I’m getting ready to cook some up tonight. I think it would a perfect remedy to whatever ails you. This sounds yummy. I’ve been eating so much pumpkin soup in the last few months; it would be nice to shake that up with a bowl of soup made with coconut milk. I wonder if you could replace the red curry paste with green curry paste for a different flavor? Sure you could Jen. I used red chili paste when I made it last night but didn’t consider that it might need more coconut milk to balance the heat. Fortunately, I had a second can of coconut milk and was able to tame it some. I also used shrimp instead of chicken this time. Took a pound of raw shrimp (peeled) and cut them into bite sized pieces. After the soup had cooked for 15 – 20 minutes I killed the heat and added the shrimp. After about 5 minutes, the shrimp were done. soup. you speak my language. and coconut milk makes everything oh so good! Lan, I firmly believe soup is good food. 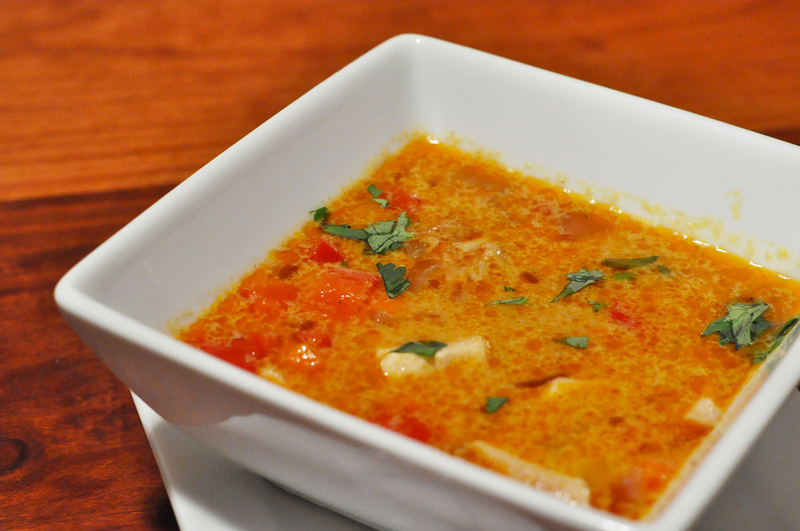 I hope you’ll get to know Chicken Coconut Curry Soup.